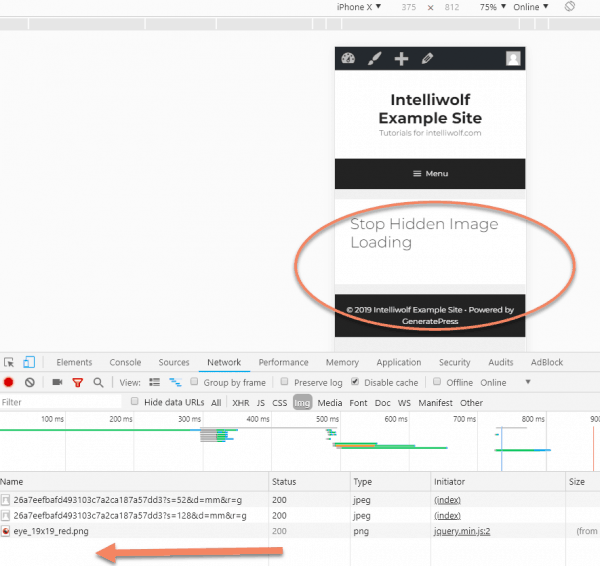 One of our readers commented on the tutorial about responsively hiding elements in Elementor raising a great question: what if you don't just want the element to be hidden - what if you wanted to prevent an image from even loading on mobile. That literally only stops the browser from displaying the element. 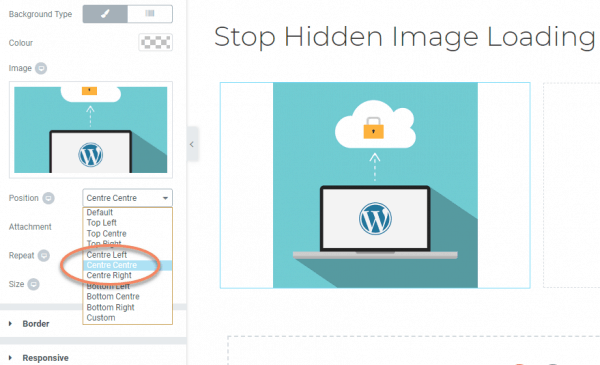 The problem comes if you have a large image that you're trying to hide. The browser will still load the image. It just won't be seen. 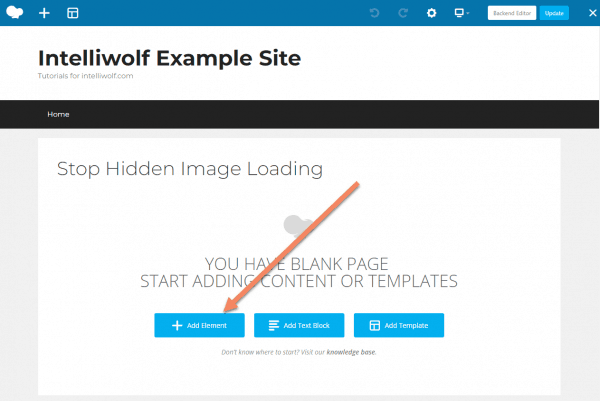 But it adds to the "weight" of the page and will negatively impact the page load speed. See how the image above is not visible on a mobile size? I've circled where it appears on larger browser sizes. Now look at the bottom of the graphic where the files that are loaded are listed. That png is what's hidden. If you're just talking about a couple of kilobytes, that's no big deal. 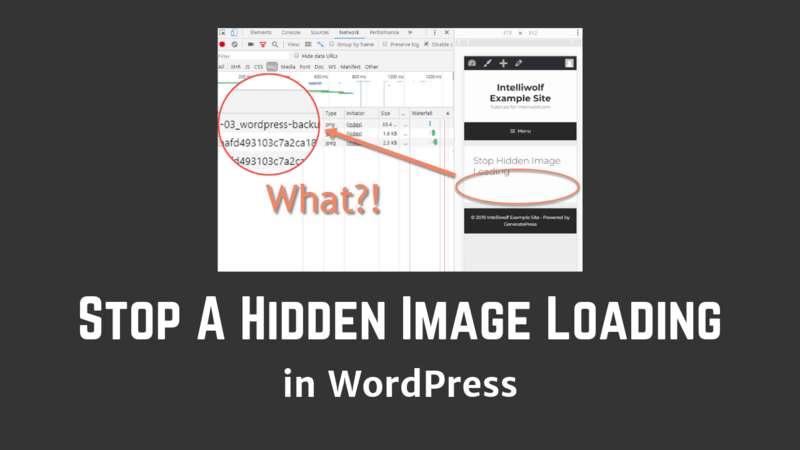 But if the hidden image is a megabyte or more, you probably shouldn't be loading that on mobile. Unfortunately, browser technology still has a way to go. To stop a hidden image loading on mobile (or any specific screen size), we need to get a little creative. 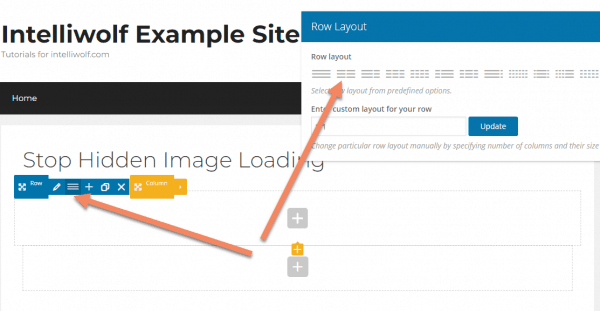 Thankfully it's usually not too difficult to do in most page builders. 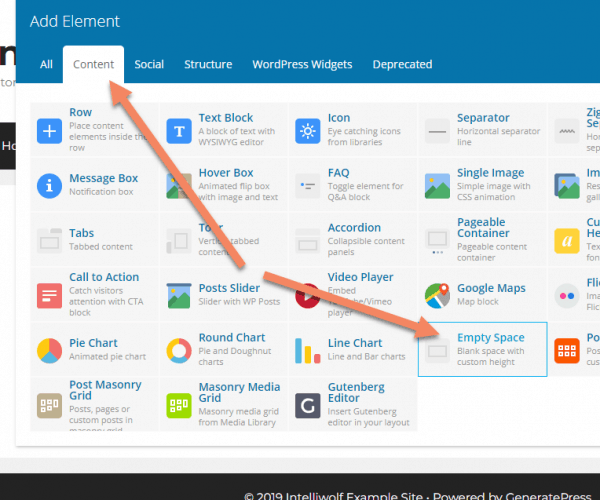 See below for the steps in various page builders. 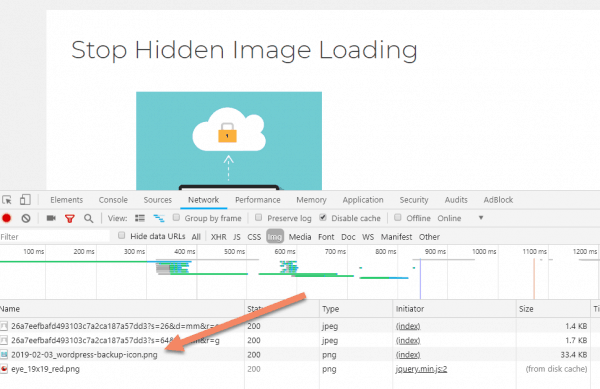 What's the principle behind preventing the downloading of a hidden image on mobile? Ordinarily, we bring in images using the <img> tag. 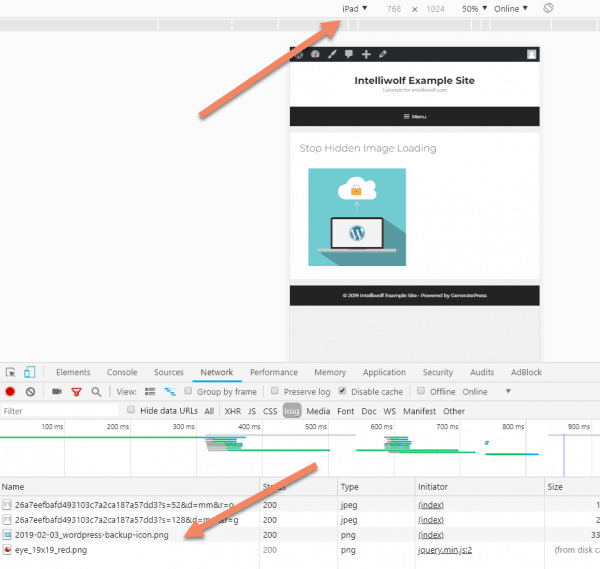 Even if the display is set to "none", the browser will still try to download the image. Instead, we create a box and set the image as the background. 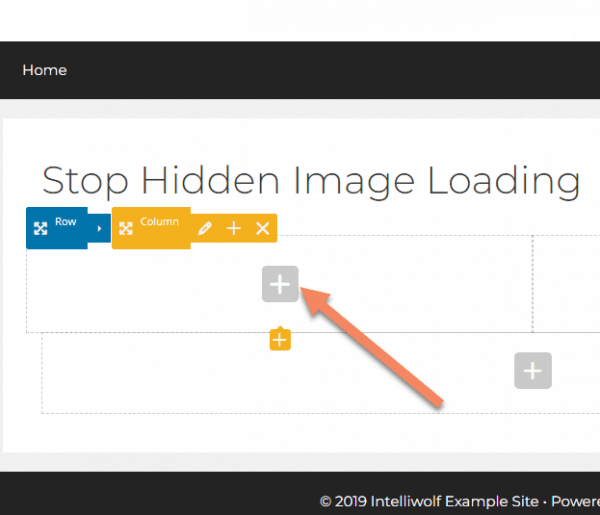 If you set a parent of that box to display: none; then the browser won't try to load the image. It's a bit hacky, but it's the best we've got in the circumstances. 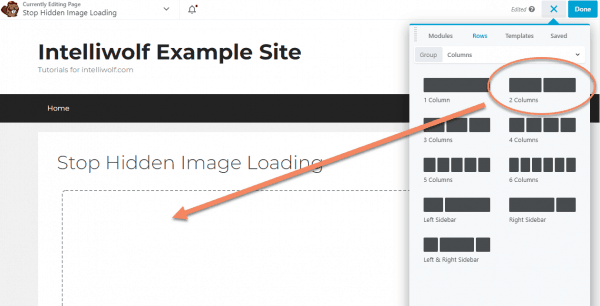 If you're doing this without a page builder, you're probably better off setting a class on the box, then responsively setting the background-image to "none". That's what we'll have to do in the example with Divi. 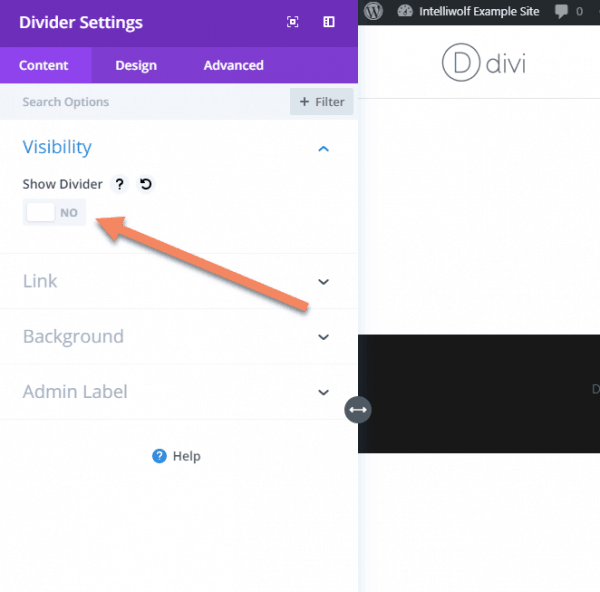 The other page builders on this page have the responsive hiding attached to a parent of the box, but Divi attaches it to the box itself. A little annoying, but I'll show how to get it done. First we need to create an area to hold the image. Maybe a little counterintuitively, we're not going to use the image widget for this. We're going to use the spacer, so we can control the height of the image. 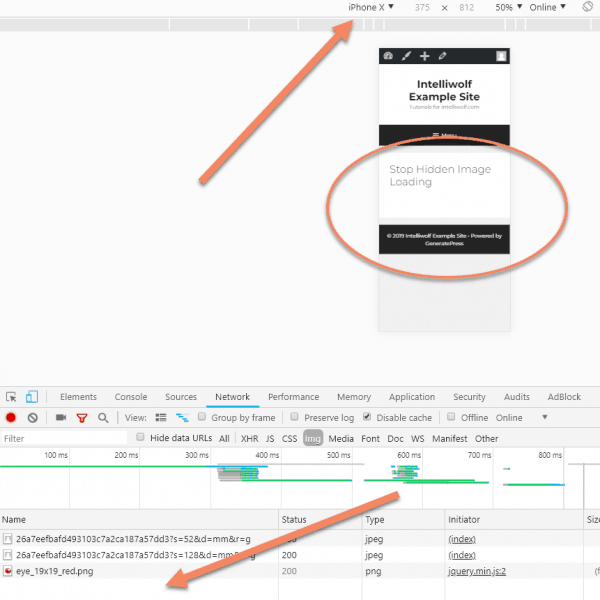 Set the height to 300px, or whatever height you want the image to be. We're actually adjusting the height of a blank container for now. The image will be the background of this container. With this method, we lose the ability to easily keep the width from being too wide for the height. This will make more sense in a couple of steps. If the image ends up not looking right, come back to this step and adjust the height. Switch to the Advanced tab, open the Background accordion and click the paintbrush icon. This will open the Image block. Click that. Choose your image for the background. You'll return to something looking like this. Notice the image is zoomed all the way in on the right? We'll fix that next. Set Position to "Centre Centre", Repeat to "No-Repeat" and Size to "Contain". 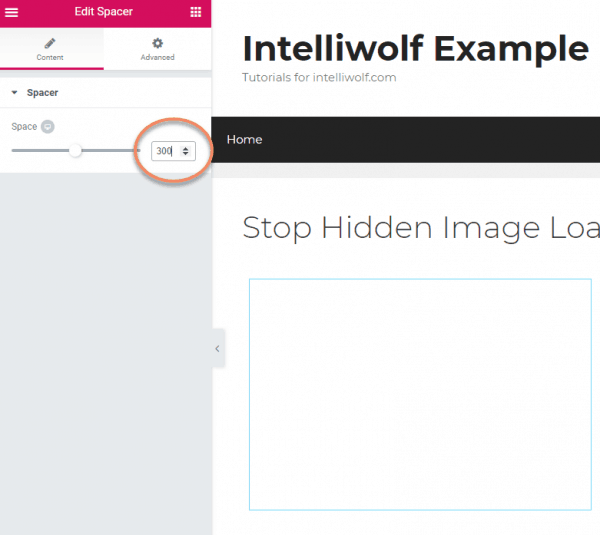 Contain will automatically change the image to be displayed completely inside the spacer, instead of being zoomed in. You may have to play with sizes to get it to look the way you want. If you want a left-aligned image, change the Position to "Centre Left". 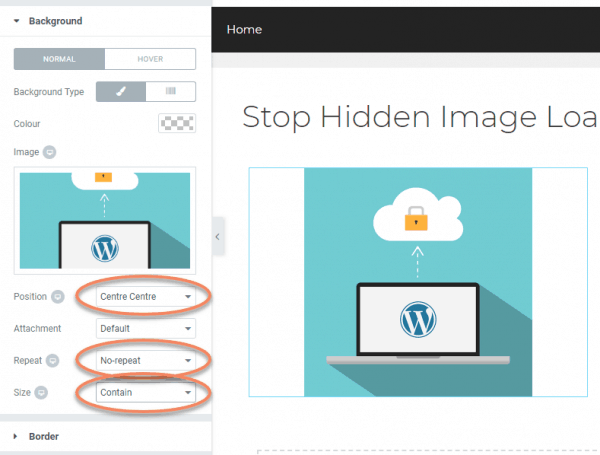 Change it to "Centre Right" for a right-aligned image. 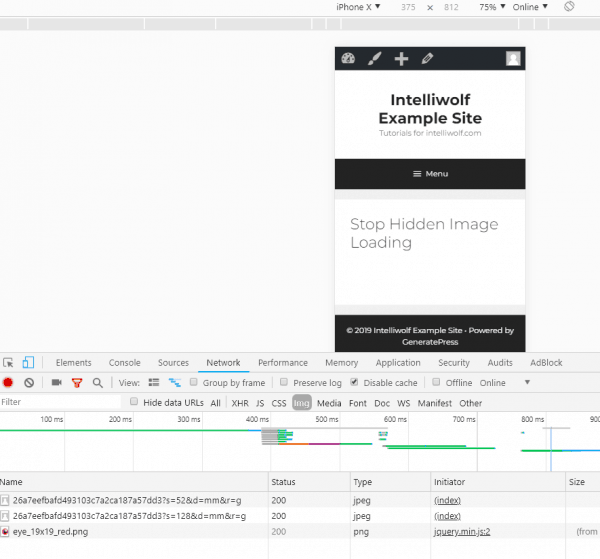 The last step is to open the Responsive accordion and choose "Hide On Mobile". Then click "Update" to save. 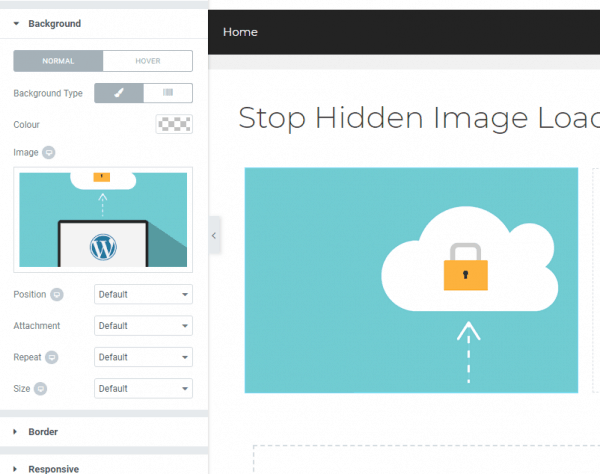 On the front end, our image still loads the way we want on desktop. When we switch the size to mobile and reload the page, the image is hidden from the content. If you look at the bottom of the graphic, you can see that the image is no longer loaded by the browser. It still looks the way we want on a Tablet, and is still being loaded. 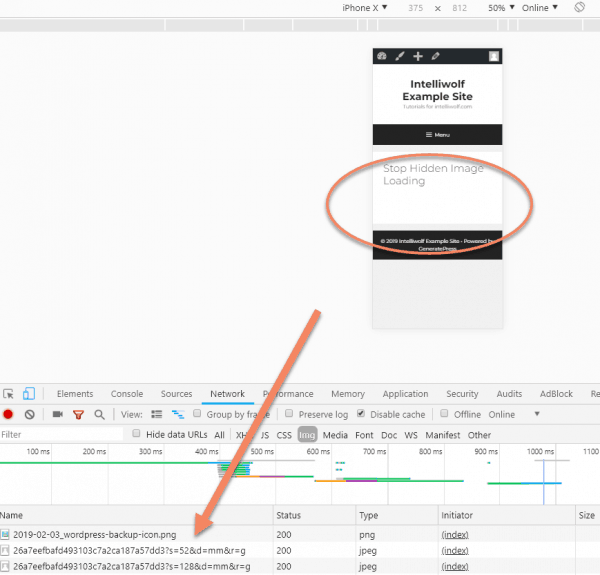 It's even easier to stop Beaver Builder loading a hidden image on mobile that we did with Elementor. This is because Beaver Builder has the ability to easily set the column height. Let's load up our columns. 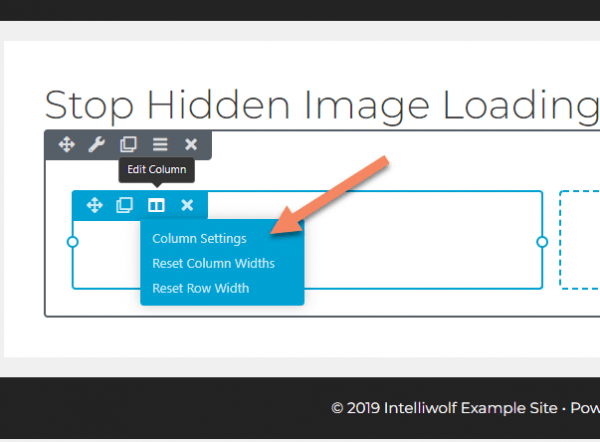 Hover over the column where you want the image. Click Edit Column, then Column Settings. 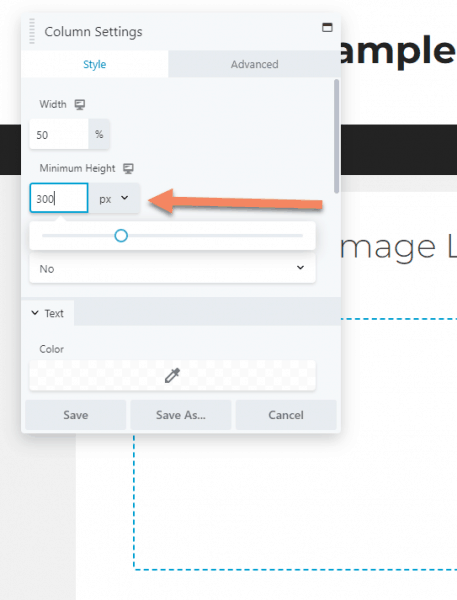 Set the height to 300px or whatever height you want the image to be. Scrolling down, set the Background Type to "Photo". Click "Select Photo" to choose the image. You can set a different size (I did Medium for this) if it works better. Change the Scale to "Fit". This is the same as "Contain" in Elementor. The other settings you can leave as default. You might want to change the Position if you want a different alignment. 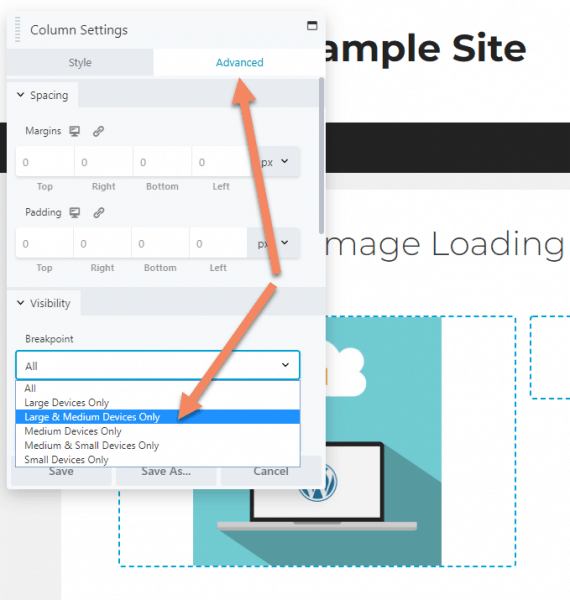 Switch to the Advanced tab then under Visibility, set the Breakpoint to "Large & Medium Devices Only". This will hide the image from mobile browsers. Be sure to save the page. The image loads as expected on Desktop. The image is hidden from the content on mobile. The image is no longer loaded in the browser. 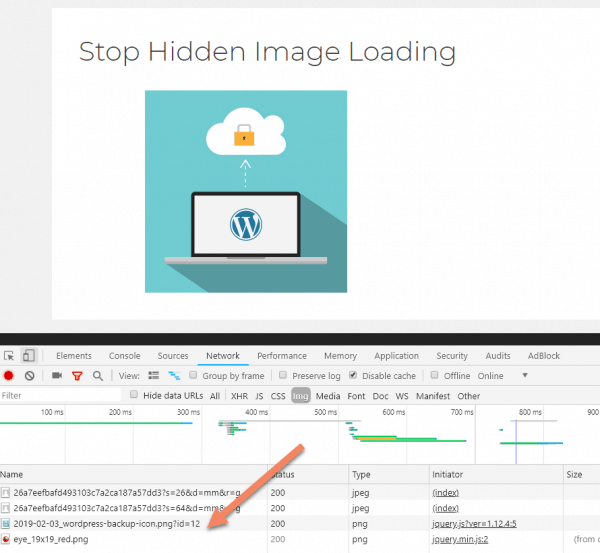 The steps for preventing a hidden image loading in WPBakery Page Builder are pretty much the same as for Beaver Builder and Elementor. We'll start by adding a Row. I'll change the Row Layout to two columns, to stay consistent with the other examples, but you do whatever layout works best for your design. 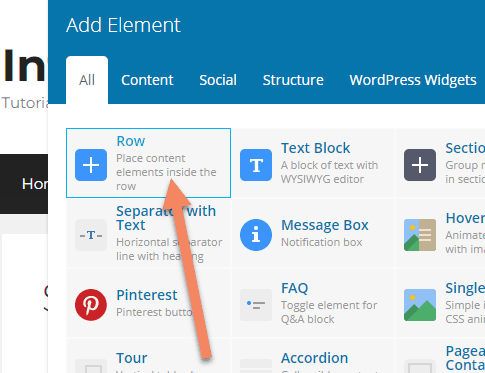 Click the grey "plus" button to add an element inside one of the columns. We're looking for the Empty Space element. You can find it under All or under Content. 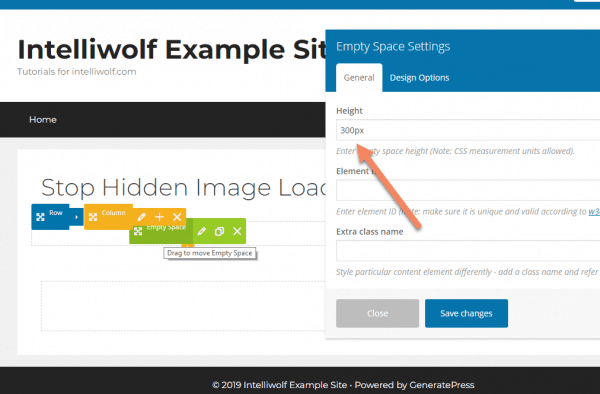 Set the height to 300px. This will be the height of the image in your design. 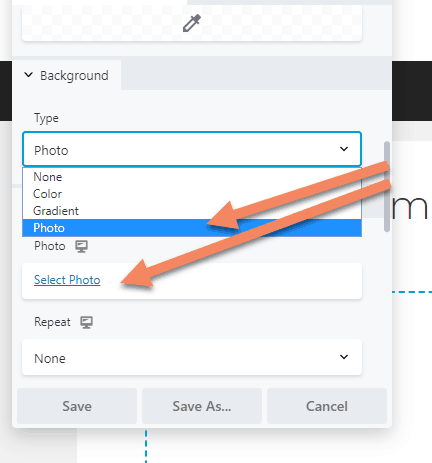 Choose the Design Options tab, then click the box for background images. 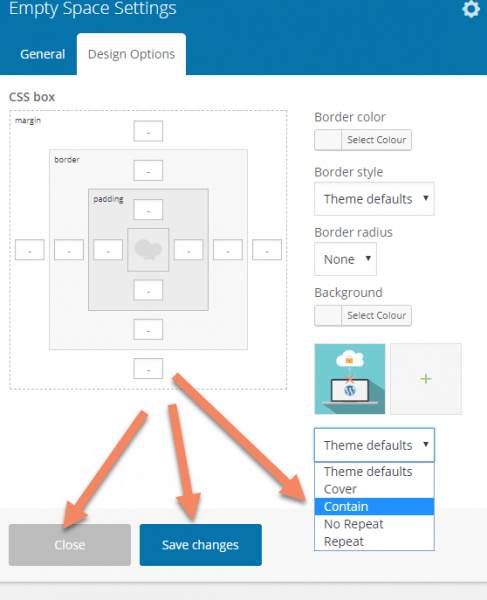 Once you've chosen your image, change the background from "Theme defaults" to "Contain". Save changes and close the popup. 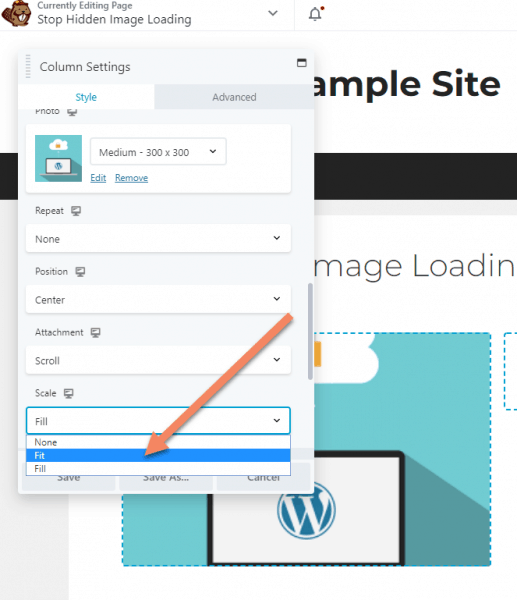 Hover over the image and click the pencil icon next to Columns to bring up Column Settings. 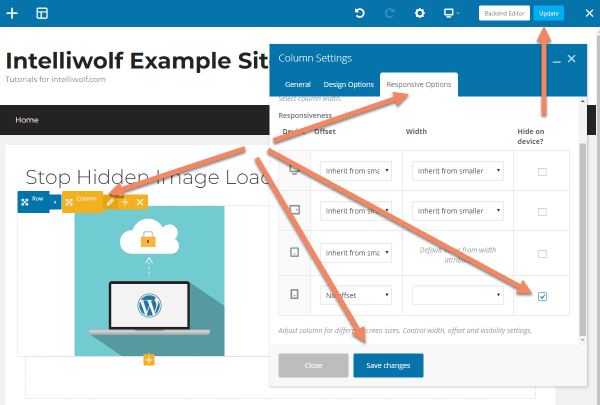 Switch to the Responsive Options tab, then check the box for Hide on device for mobile. You can hide it on other sizes too if you need. 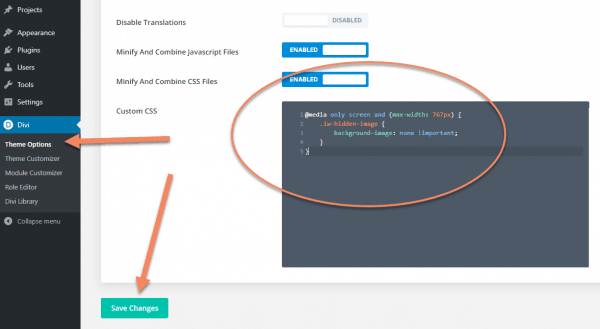 Save changes, then update the page. If you go to the page, you'll see the image looking as it should. The image will be hidden on mobile and the browser will no longer load the image. 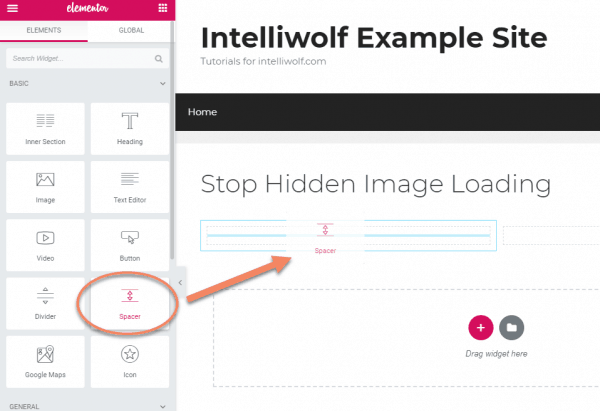 Unfortunately, stopping Divi from loading a hidden image is a little more complicated than for the page builders I discussed above. 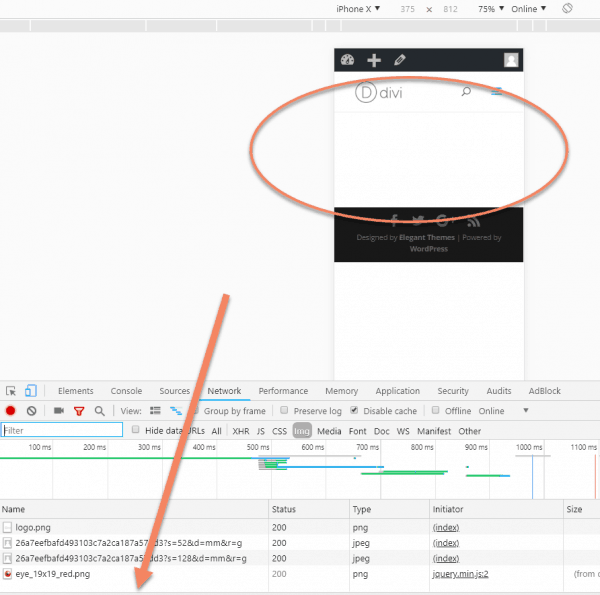 The problem is that Divi applies the responsive hiding to the same div as it applies the background image. We still have to use a Divider module, rather than an Image module. Read more about what we're doing and why in Principles, above. Start by inserting a two-column row. Turn the divider line off by switching Show Divider to "NO". 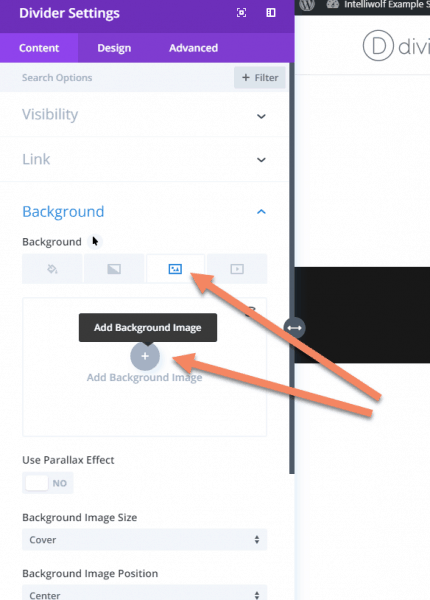 Open the Background tab, choose the image background and click the plus icon to add a background image. Once you have your background image, change the Background Image Size to "Fit". Otherwise it will look strange like in the circled section. 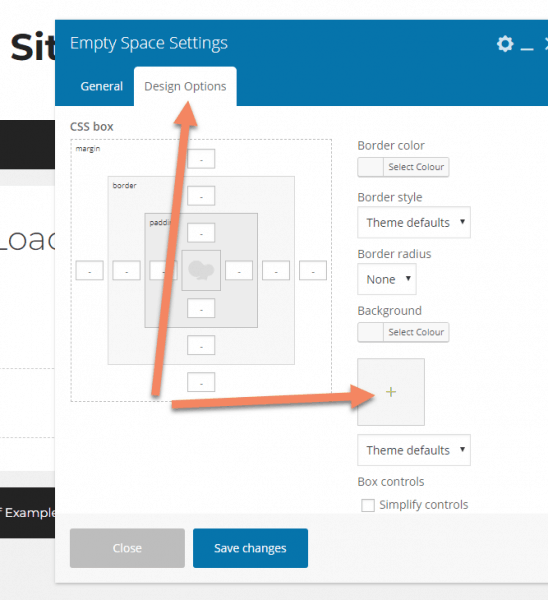 Still in the Divider Settings, switch to the Design tab and change the Height to 300px. 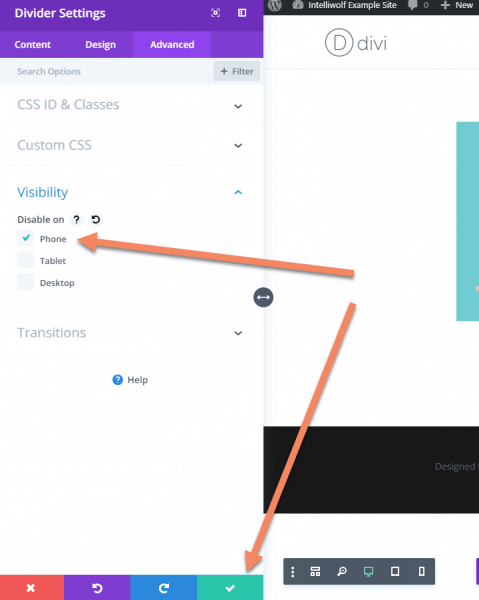 Switch to the Advanced tab and add a class for your hidden images in CSS Class. 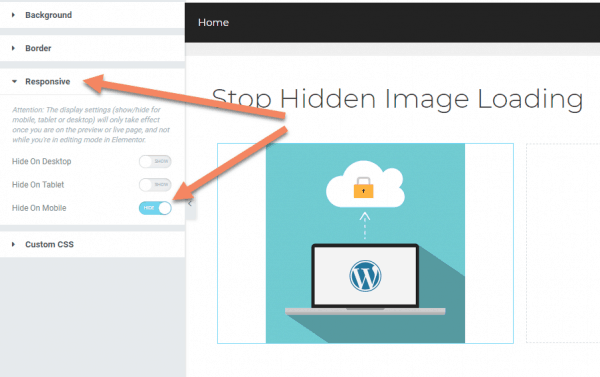 I've used "iw-hidden-image", but you can use anything that's not otherwise in use on your site. 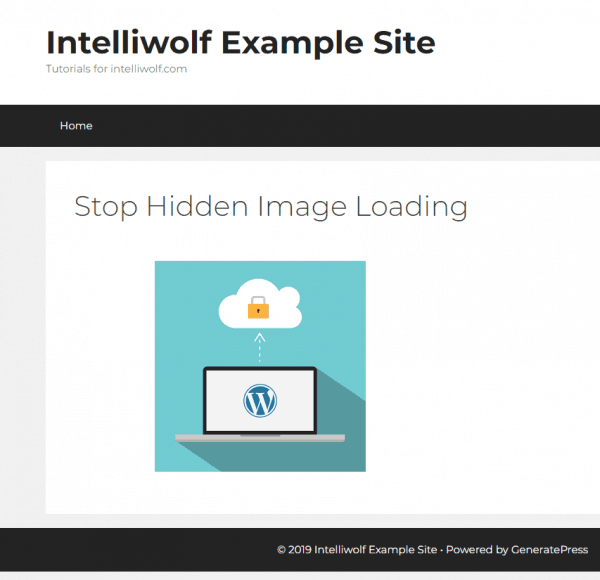 For classes like this, I like to use the initials of the site (in this case "IW" for "Intelliwolf"), followed by an easily recognizable description. Still on the Advanced tab, open the Visibility accordion. Save the settings and the page. 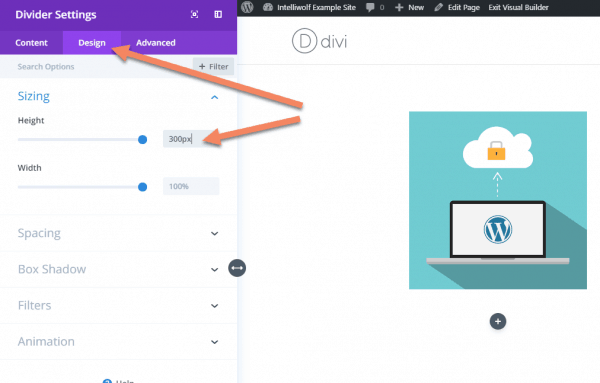 This is where the steps for Divi diverge from the other examples. If you pull up the page on mobile, the image isn't displayed, but it's still being loaded. 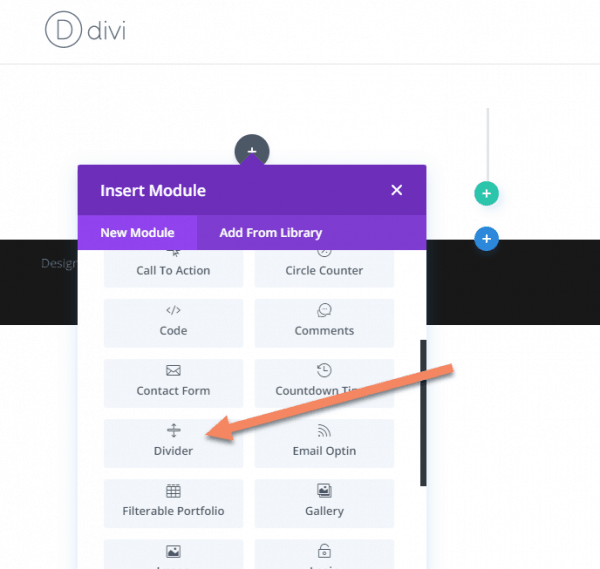 To fix this, we'll need to add some custom CSS to Divi. 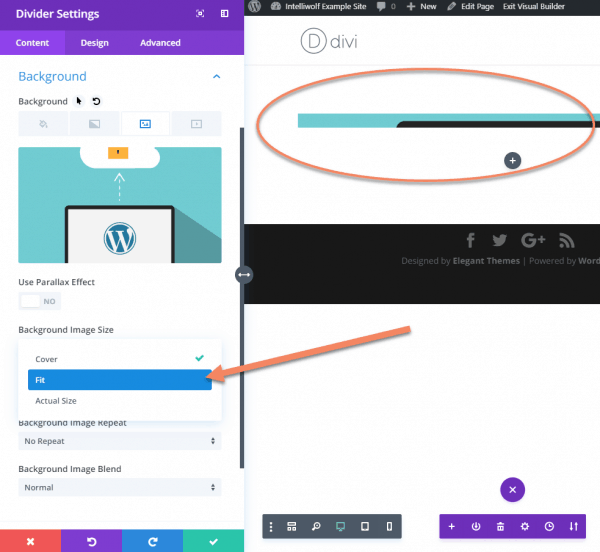 In the WordPress Admin area, go to Divi -> Theme Options. 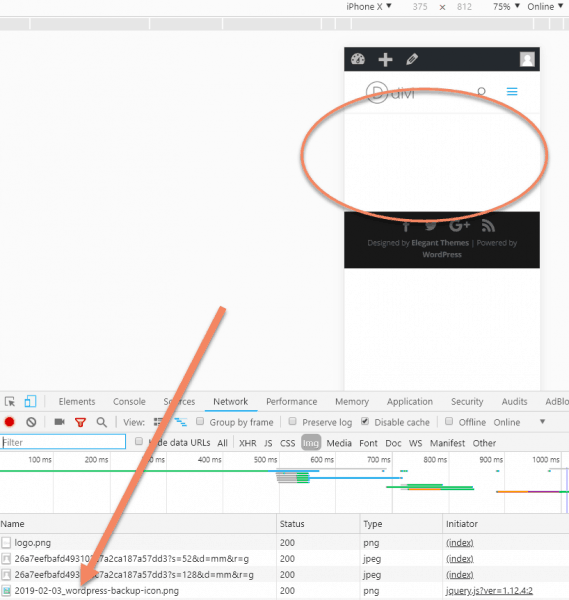 Scroll all the way to the bottom of the General tab (which should be automatically selected) until you see Custom CSS. 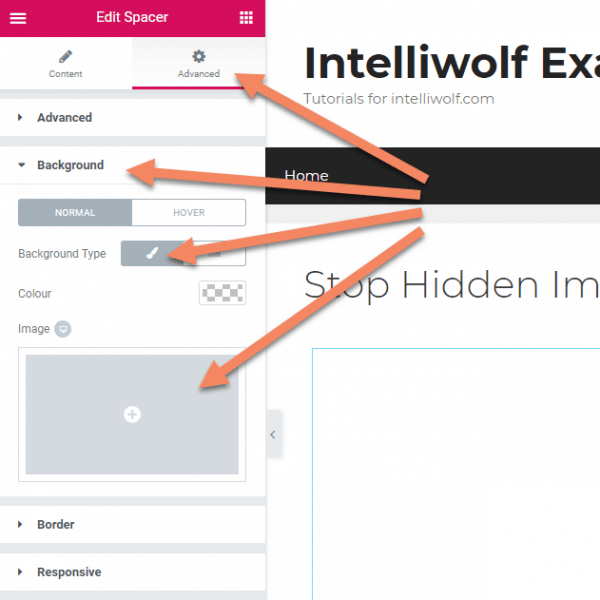 Change .iw-hidden-image to the class you chose for the Divider above. Make sure to add the period at the start. What this does is forcibly remove the background image on screens 767px wide or less. Because we used a class rather than an ID, you can apply this class to any other images you don't want displayed on mobile. Now when we pull up the page on mobile, the image is no longer loaded. But it's still displaying correctly on desktop. 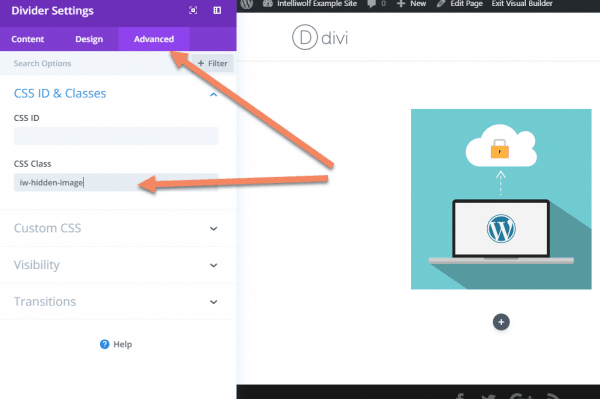 I am using Divi. I am just wondering if I am using 2 slide modules, one on mobile and one on the desktop. 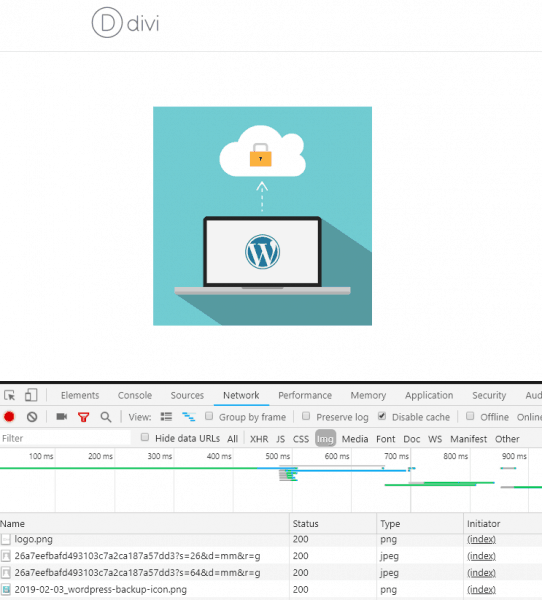 What can I do, in order to Stop A Hidden WordPress Image Loading On Mobile?